Not much is known about al­Khwarizmi’s life. He was born around 780 in Khwarizm, a town in present­ day Uzbekistan, and he lived much of his life in Baghdad, in what is now Iraq. Al-­Khwarizmi was one of the most important Arabic mathematicians to adopt the Hindu number system and make improvements on it. Hindu numerals, with Islamic improvements, were the basis for the Arabic number system. Al-­Khwarizmi refined that system and did much to popularize it. His innovations included adopting the use of zero, which was not widely used by Arabic mathematicians. 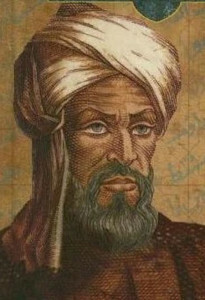 His text Al­jabr wa­al­muqabilah (c. 830) helped to systemize the subject of algebra, and the word “algebra” comes from the title (Al­jabr). The text describes methods of Al­jabr, or restoring equations. By restoring, he meant that if you alter one side of the equation, you have to alter the other to restore the balance. For example, if you wanted to solve x + 5 = 11 for x, you would have to take 5 away from the left side and, then, to restore the balance you would take 5 away from the right side. He also wrote about astronomy. His tables of future planetary and stellar positions are the earliest complete astronomical work to survive from Islamic astronomers. In addition, he described adaptations of the Greek astrolabe, which his colleagues improved to measure celestial positions using both altitude and azimuth (a word of Arabic origin designating a horizontal arc along the horizon). Al­-Khwarizmi is thought by some scholars to be the founder of modern algebra, and his popularization of and innovations with Arabic numerals provided a convenient number system for future generations. Al-­Khwarizmi’s text on “Al­jabr,” or restoring equations, presented and described methods of manipulating numbers that we still use today. This text introduced algebra to European scientists and mathematicians. Girard of Cremona translated it into Latin in the twelfth century, and this translation became the principal mathematical textbook used in universities well into the Renaissance. Algebra provided foundations for other fields in mathematics including the calculus. His adoption of zero into the Arabic number system helped to solidify the concept of place value and provided a foundation for the decimal system. Counting and calculating in Roman numerals was cumbersome and inadequate. The Arabic system soon replaced the Roman. It allowed future mathematicians and lay people alike an ease of calculation not previously possible, and it has remained with us to this day. His work on the Hindu­ Arabic numeral system has been preserved only in a Latin translation Algoritmi de numero Indorum. The English title is known as Al-Khwarizmi on the Hindu Art of Reckoning. The title, in particular the use of his name Al­-Khwarizmi, gave rise to the word algorithm, which refers to a finite series of detailed instructions that aim to accomplish a specific task. Algorithms are a fundamental approach in many areas of mathematics and, in the twentieth century, have been widely used in computer science. *Scholars cannot date the specific events in Al-­Khwarizmi’s life with accuracy.